In this article I’m going to show you how to dramatically increase your conversions and your Re-targeting Results. These Re-marketing and Re-Targeting Best Practices can help to double your traffic and revenue. Keep reading! I’ve seen some clients 10X their conversions using re-marketing in their strategy. I have done Digital Advertising and Digital Marketing for almost a decade – helped build websites up to 12 million visits per month and managed digital campaigns up to 1.5 million per month. THERE'S OVER 2-BILLION PEOPLE ON FACEBOOK NOW AND GROWING! Download this remarketing checklist for free. Learn how we set up retargeting for your ideal clients. First – What is Re-marketing and Re-Targeting? Have you ever noticed an ad following you around on different websites? That effect is caused by re-marketing. It’s a small piece of code (called a cookie) placed on a visitor’s computer that then allows ads to show up on other sites, not just the one you are currently on. “Re-marketing” or “Re-targeting” – What’s the Difference? Re-targeting or re-marketing is a form of advertising that helps keep your products top of mind to the consumer. It is most popularly used with Facebook advertising and Google Adwords. It is an online advertising strategy aimed at users who have already visited your site. It is at its best when working in conjunction with other digital advertising strategies. Re-targeting is a relatively new phenomenon, so you have the advantage of being one of the earlier adopters. Any good Digital Marketer will ALSO provide re-marketing as a tactic. It is one of the most effective forms of advertising. Re-targeting is picking up steam in the PPC world, and with good reason. It is often most successful when you carefully segment your prospects based on the pages they’ve clicked on. It is one of the best way to sell. It can be a powerful strategy for your company to get more bang out of your buck in online marketing. Sometimes it takes a potential visitor 8 visits to trust your store. This is achieved by continually showing ads to your visitors. Re-targeting is the most direct way to try to convert a website visitor into a paying customer. It helps e-commerce stores recover lost revenue due to shopping cart abandonment. It will help you maximize the effectiveness of those dollars and ensure you’re not leaving anything on the table. It has great value — for a while. 1. Do your campaign settings make sense and match your campaign strategy and goals? Goal Setting is a vital first step. 2. Have you separated search and display campaigns? If you merge both your Click Through Rate suffers. 3. Is ad rotation set the way you want it? Both Google and Bing offer the option to optimize for clicks, or to rotate ads more evenly. 4. Are your geographic locations correct? Are you targeting the right areas and excluding the wrong ones? Very important. 5. What about your campaign budget? You can actually merge budgets now – pretty cool. But do shared budgets make sense for you? 6. Considered dayparting? Are your customers searching for you after hours or on weekends? See what days are driving the most traffic and increase spend on those days. 7. Mobile and Tablet Evaluation – Do you want Mobile and Tablet Ads? 8. Are your results different by device? Mobile phone users want quick and easy instructions – and rarely do large purchases. Keep this in mind: iPhone and iPad users may be bigger spenders, test different devices for best results. 9. Should you use a different message in ads? I’ve seen one headline drive a 80% better response rate. Check out my article on Top PPC headlines. 10. Is something failing? A/B testing is important but test to make sure your whole thing is working first. Test your campaigns like a visitor would – sometimes you may find pages or URL’s that don’t work – or forms that don’t send leads. Test to make sure everything is perfect on the visitor side. The key to success is to test and refine, test and refine again. Secret TRICK: Add a conversion pixel to stop advertising to (and wasting money on) people who’ve purchased or signed up already. Use this checklist for both new and existing PPC campaigns, and watch your results improve! Is Google the most effective modern way of advertising (besides word of mouth) today? If you target Clicks – you will get clicks – if you target purchasers you will get purchases. If you target views – you will get views. Re-targeting has been around for a few years now. A few years ago, pretty much all a local business needed to do for good search engine rankings was to build a decent website and get some targeted links back to the site. This strategy worked well for local and even regional businesses! Local Search Marketing is supported by hundreds of Search Engine companies like GOOGLE Yahoo, Yelp, and Bing. A search engine’s goal is to make their search results as relevant and useful as possible, and they are achieving this goal by using ”Maps and Local Listings”. Step 1 – Research what your IDEAL CLIENTS are searching for? Local search marketing encompasses many things, but primarily focuses on paid search marketing with organic search marketing. We strongly recommend organic search marketing (most commonly referred to as SEO) for long term growth and results, but paid marketing has clear advantages for fast results. The ratio of marketing efforts depends entirely on your niche and preferences, but we can safely say that without devoting part of your budget to at least one, you’re short-changing your overall online visibility. For example your re-targeting ads may get 10X the click-through-rate which can lower your cost per click. Re-Targeting is at its best when working in conjunction with other digital advertising strategies. Frankly, it is unlikely to be as effective as a standalone tactic. For one thing, re-targeting can’t drive new traffic or generate interest or awareness. It will improve brand recall among those who have already heard of your brand, but at its root it’s a conversion optimization tool. Re-targeting comes in many forms, but we’ll start with the form of re-targeting that is both the most common and the most universally effective: “site-based re-targeting”. Site-based re-targeting is, simply, the practice of serving ads to people who visited your website but left without completing a desired action like making a purchase or filling out a lead form. Re-targeting is so effective because it focuses your spend on people who are most likely to make a purchase, increasing your conversion rate at a relatively low cost. Re-targeting automatically sends ads and messages to your online store visitors based on their profiles. That said, you have full control over what message to send, the overall design of the ads, as well as the rules that trigger the ads. Re-targeting greatly benefits online stores that want to maximize their earning potential by tracking visitors who went through the products but left without checking out. The software tracks your audience anonymously all over the internet, analyzes their actions and behavior to create detailed profiles of your customers. Re-targeting helps companies reach website visitors who don’t immediately convert. 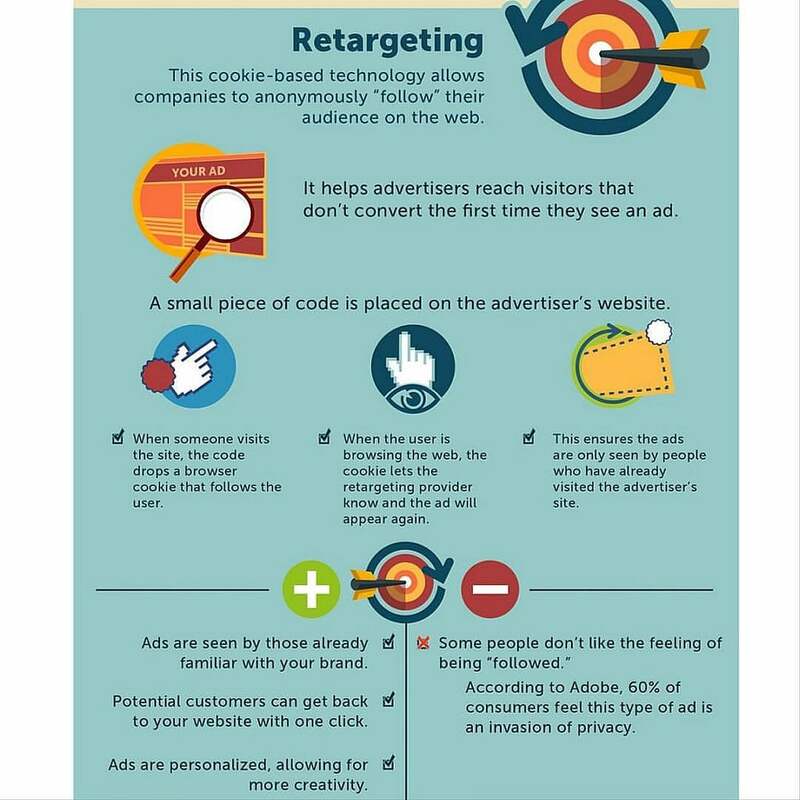 In other words, re-targeting can help your business connect with potential customers after they leave your website and encourage them to return. Target exact demographics by age, location, income, profession. Target exact searches for your products and investments. A skilled online marketer can increase your marketing by 10X. What are your thoughts on retargeting and remarketing best practices?